“Visual language” is often overused merely as a synonym for mark-making. 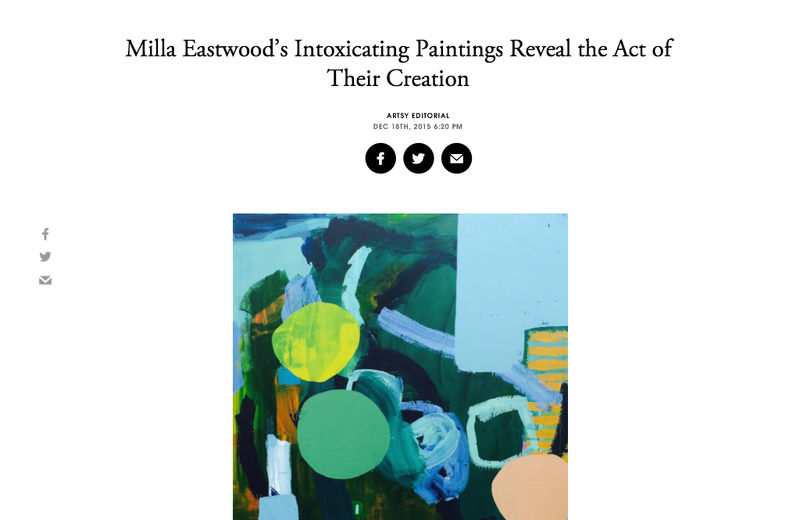 London-based artist Milla Eastwood, however, has succeeded in sculpting a distinct voice for herself amongst a growing crowd of gestural, abstract painters. “Drunk on Colour” at The Dot Project not only tramples the well-worn path between sensation and painterly action, but communicates this personal journey to the viewer in a boldly authentic way. It is easy to depict what surrounds you; smartphones have made this the norm for artists of Eastwood’s generation (she was born in 1990). The act of taking that filtered selfie, however, is not ordinarily shown as part and parcel of the image. Surrounding herself with the natural world, Eastwood makes the decision to take herself away from the banal urban autonomy that London instills in its artists. Yet natural objects, surprisingly, are rarely (if ever) the subject of Eastwood’s paintings. Rather, as “Drunk on Colour” evidences, it is precisely the action of striding toward the peripheries that the canvases in The Dot Project exhibit. Materially, the canvases show no signs of being worked on en plein air, despite the fact that many were executed in natural landscapes and botanical gardens. Similarly, symbols that often haunt dream-readings and clichéd horror movies, such as skeletal trees, lose all obvious connotations when juxtaposed not only against Eastwood’s limited vibrant palette within the frame of the canvas, but also against the stark, modernist form of the white cube gallery space. Brash, horizontal slashes and frantic, paranoid scrawls—which bring a bodily violence to the first works one encounters in the exhibition—work alongside filled blocks of color. Each mark, itself loaded, only serves to inform those around it. The potency of experience is something that Eastwood excels at depicting; this is a powerful tool to hold as an artist. Viewing the works, one realizes that a triad has been completed: the experience of the artist, the expressionistic gesture performed during painting, and the effect this has on the viewer simultaneously collide and coincide. “Drunk on Colour,” in this way, is perfectly named, due to its understanding of sensation. Inebriation is something that has to be experienced, yet—through her flawless visual renderings of emotion—Eastwood imbues each work with a potency to enliven. This is what makes the works immediate: they communicate the experience of the artist to the viewer. In the vein of Albert Irvin, an artist who evoked many things without overtly depicting them, Eastwood harnesses the life force of painting itself and blurs the lines between surface and space. Works such as Back into the green cave where my spirit lives (2015) seem to spill out over the confines of the canvas, escape onto the walls, fill the room, and wash over the viewer. More recent works, the last to be seen when navigating The Dot Project exhibition, indicate where future pieces by the artist may venture. The single-surface canvas is replaced by layered surfaces, as fabrics are applied to the canvases and mark, once again, Eastwood’s immediate relation between action and perception.